That’s right: alive and still kicking, the George-Washington and Jefferson National Forest invites you to the beautiful shores of Virginia for its 2017, Passport in Time excavation project! The Archaeological Society of Virginia, Chesapeake Bay Archaeological Consortium, Department of Historic Resources, and USDA-Forest Service have recognized the impacts of both rising sea levels and catastrophic storms on archaeological resources along the Atlantic Coast, in the Chesapeake Bay, and within the tidal sections of tributary rivers. There are also concerns about damage to interior sites resulting from deeper plowing and sheet erosion. With these factors in mind, time is of the essence to locate, record, and preserve as many of these historic and prehistoric treasures as possible, and we need your help! This spring, as a cooperative effort among PIT/the FS and other agencies, and as a field school, we will test two important sites in Northampton County, along Virginia’s eastern shore, to enhance data collection on their threatened resources. The first is Pear Valley: the earliest surviving, single-room-plan house in Virginia. The site was a small Yeoman’s Cottage, dating to ca. 1740, once occupied by a farmer raising grain for market. It is currently owned and managed by the Northampton Historic Preservation Society. The field school will undertake limited test excavations in an attempt to locate the foundations of the structure’s outbuildings, which will aid in site management and interpretation. Our second objective, the Eyreville Site, is located on the grounds of a late 17th- to 19th-centuries plantation house. The extensive farm lies alongside the Chesapeake Bay (and is easily reached from Route 13); the Eyreville Site, where our test excavations will focus, is situated to the west of the main house. During initial testing (and the removal of a great many tree stumps! ), numerous artifacts dating to the 17th-century were recovered. The assemblage, to date, includes rose-head nails, bricks, blue and grey stoneware, tin-glazed ware, gin and wine bottle fragments, and numerous pipe stems. 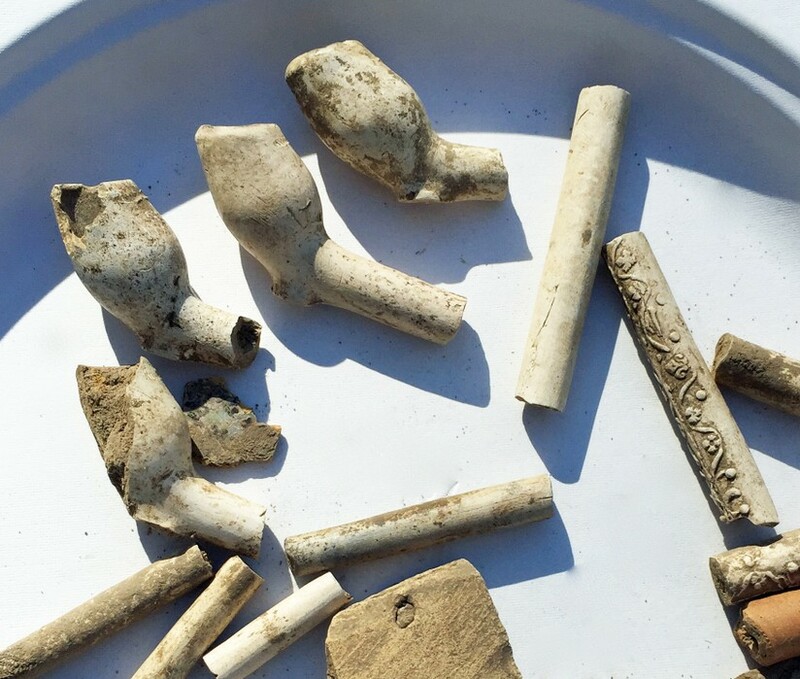 Also recovered, and of particular note, were Dutch yellow bricks and several elaborately-decorated Dutch pipes. During our field testing and documentary research this spring, we will attempt to isolate the structure’s foundations and other features in order to determine the site’s function and to obtain more precise dates of its occupation. Participants in this year’s PIT project will be exposed to a wealth of information, including proper field testing and documentation methods, early Virginian history, and much more. There is also much to see and do here in your hours “off the clock:” it’s a beautiful place to be in the spring, with breath-taking vistas, abundant natural and archaeological history to explore, and fishing and crabbing right from the pier near our campsite! So, come help us document history before it’s gone; stay for the blue crab and camaraderie – see you in May!